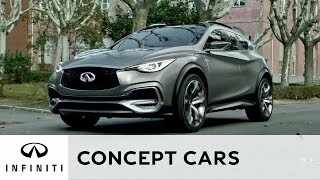 Infiniti released its part SUV part Hatchback idea with Infiniti QX30 Concept at the 2015 Geneva Motor Show. In past few months a sudden hike in the segment has been noticed. With Mercedes GLA already gaining eyeballs BMW has also expressed its interest in the segment and now this concept. It looks like that in no time this genre will be like any fare with all brands showcasing their models. However for now let us have a sneak into this all new released concept. Interior of Infiniti QX30 Concept 2015 holds its similarities with the recent Q30. Though the cabin holds a futuristic touch but we expect a lot out of this to be in production model. The dual-tone dash carries brown and grey motifs with violent accent lighting as we have seen in its predecessor. An LED has been mounted in the center with Infiniti InTouch feature. Here is one difference which we noticed is more realistic and that comes with the more production expected accent stitched and diamond quilted bolstered seats wrapped in brown leather center pieces and gray. However the steering wheel accompanied by door panels holds the similarities with the Q30 Concept but with a new color combination to add the essence of difference. Exterior of Infiniti QX30 Concept 2015 features an off-road friendly body with fleshy rear bumper and side sills. The muscular blend gets touch of aggression through its dynamic 21” wheels. Looking at the entire designed crossover version and going with the present trend of luxury automakers blending some common ingredients to make a hatchback into a crossover, we firmly believe that the exterior of QX30 Concept is much attractive (though holds similarities) than its hatchback sibling. Front fascia of Infiniti QX30 Concept has received quite a few attractive changes through cladding and aluminum trimmed bumper, which we didn’t find in the produced predecessor Q30. As we have mentioned earlier, this concept if by any means get even a little above 60 percent in its production version, you’ll surely get a treat of luxury matching standards with the Mazda CX-3. 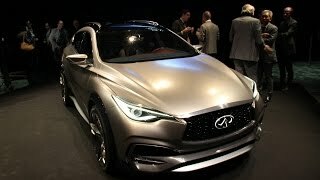 Infiniti upon unveiling its QX30 Concept 2015 shared that through this they’ll be presenting a vehicle with massive powertrain options. 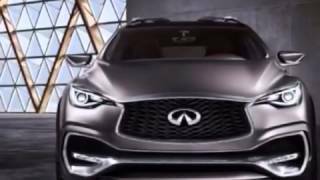 As shared by the company, Infiniti QX30 Concept 2015 will be powered by a 2.0 Liter four cylinder employed by Mercedes, pairing to seven-speed automatic transmission. However we cannot say anything for now in context to the powertrain options but looking at the dynamic design we expect that customers will have a good range of efficient engines.